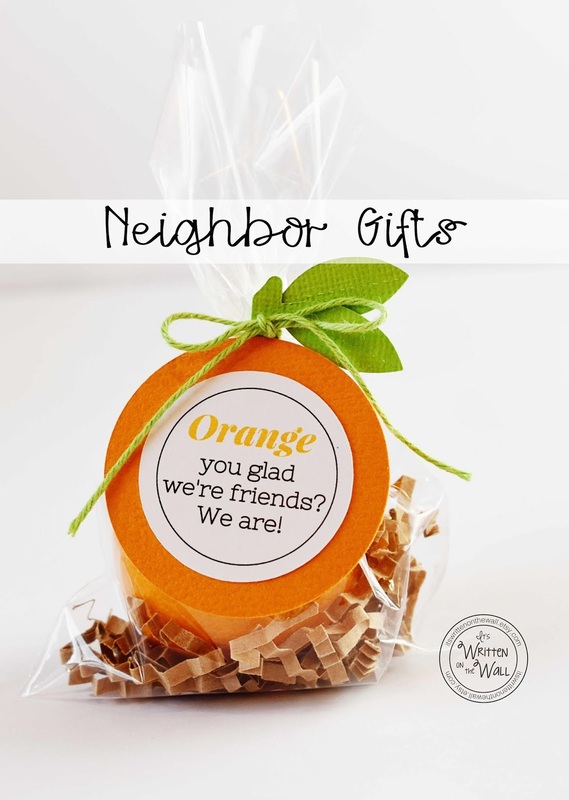 It's Written on the Wall: Neighbor, Family, Friends and Co-Workers Christmas Gifts-Orange You Glad We're friends, We Are! 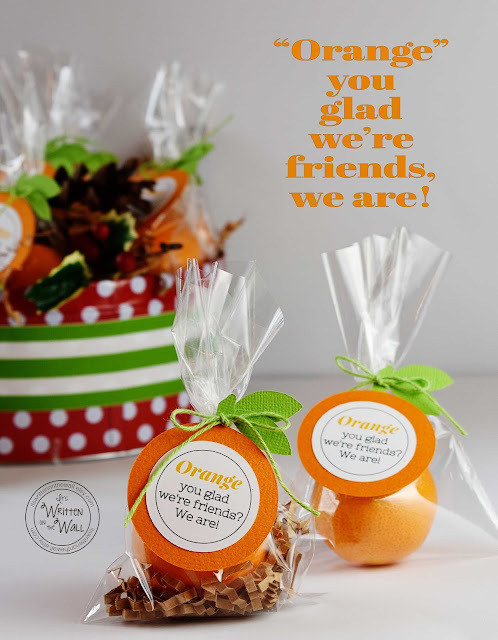 Neighbor, Family, Friends and Co-Workers Christmas Gifts-Orange You Glad We're friends, We Are! 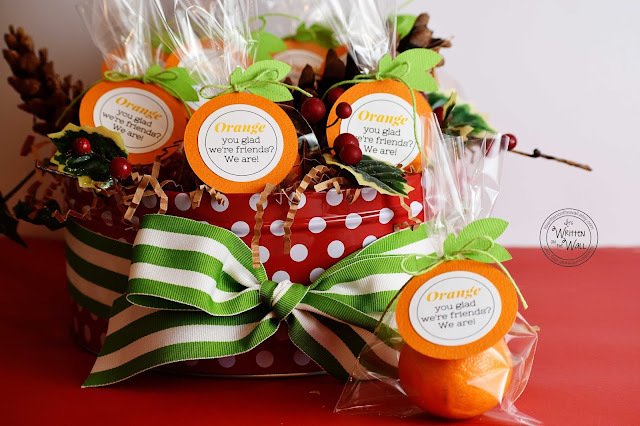 Giving oranges for Christmas has been a tradition for many many years. 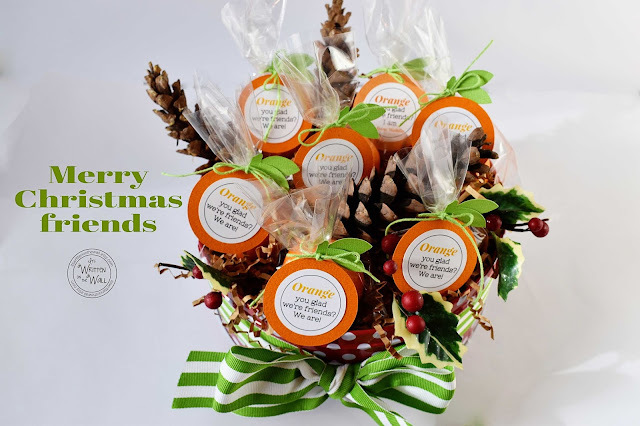 Kids used to get oranges in their stockings, in fact I'm pretty sure they still are. Here's a fun way to give your family, friends and co-workers a delicious Christmas basket of clementines all dressed up in a festive Christmas design. It such a easy kit to assemble. The photo above has brown crinkle paper in the bottom of the bag but that is certainly optional (crinkle paper isn't included in the kit but you can purchase a good sized bag at The Dollar Store for $1) We used the "Cutie' brand clementines for our samples and they are super sweet and delicious and fit perfectly in the cellophane bag with supply. A little gluing and tying required to assemble tag. 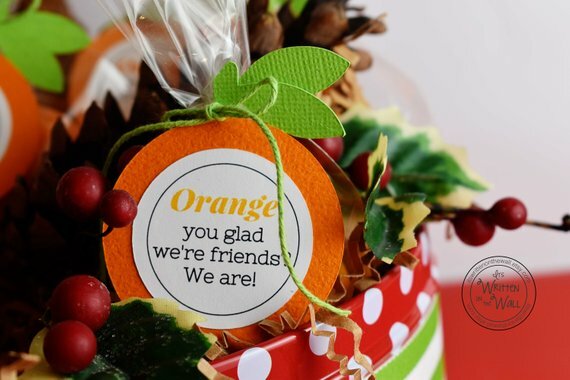 "Orange you glad we're friends? We are! The size of the tin you purchase will dictate how many clementines you put in it, of course. We got the green stripe ribbon at Joann's and you can get a roll of for 40% off any day of the week at Joanns's if you show them the coupon from Hobby Lobby app on your cell phone. They will honor that discount. CLICK HERE to go to our Etsy shop and get more information on this fun Christmas kit and get one for yourself. There are many different sizes available. If you can glue and tie a bow you're got this! We ship same or next day too. 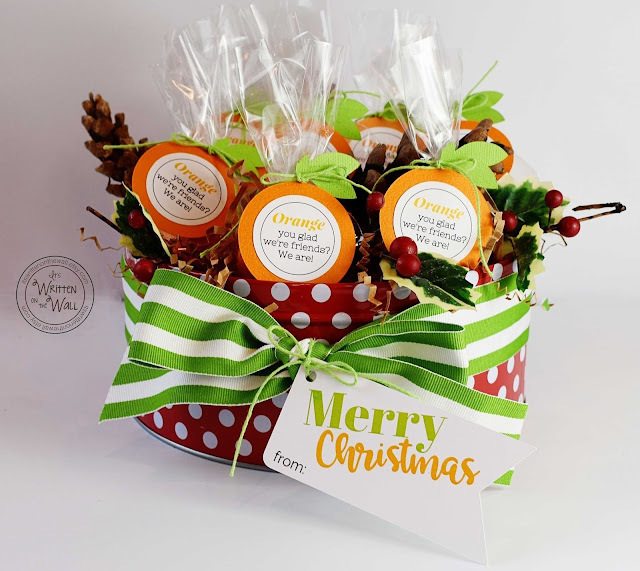 Be sure to order early!! !